Ninja training is a great substitute and/or supplement for sports of all types - staying active, learning new skills, and building strength. Most of the skills and obstacles within the ninja program are athletic movements that can be applied to all sports! When looking at all other sports, strength, agility, speed, and flexibility are all major components to be successful in team or individual sports. These components also help to create an active and healthy lifestyle. The Ninja curriculum includes all off these aspects in every class. Whether your child wants to be a professional ninja warrior or an all-star athlete, ninja skills will help benefit them. Ninja skills require hard work, quick motor skills, strength, and agility. The skills demand the brain and muscles to fire quickly to move through obstacles. In every sport, whether football, softball, or ninja, most skills and moves happen in 10 seconds or less. Ninja moves are done quickly and help build these skills physically and mentally. 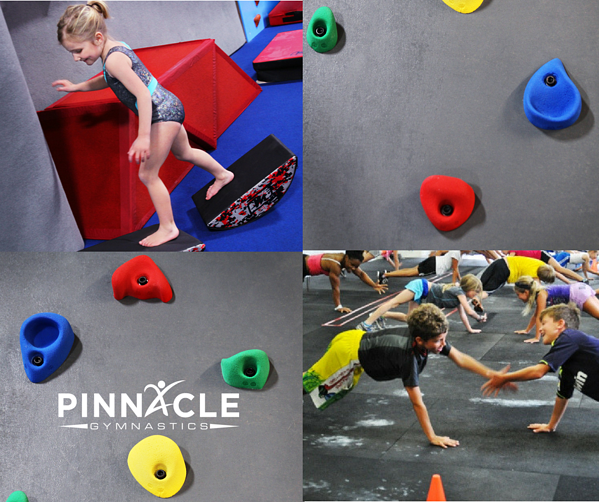 Your child will traverse though hanging obstacles to build their upper body strength and control, complete rope climbs and rock wall climbs to challenge themselves physically and mentally as a whole, and work their way through slanted steps, ninja vaults, and the towering warped wall to improve agility and create the necessary basis for all other sports. If you look at other sports, they all consist of the ability for how fast an athlete can start, stop, change direction, and start again. Our ninja classes engrain the skills while also creating the mental athlete edge for over-coming challenges and pushing themselves to be better than they were yesterday. Whether your young athlete is wanting to supplement their training or you can't find a sport they are interest, ninja classes are the perfect solution for improving your child's healthy lifestyle and athletic ability.